You know when you go shopping and find the perfect shirt to go with those new pants you got last week? Or for me, that perfect piece of Pyrex to finish a set? When suddenly it all just comes together and you’re super stoked that you’ve found the right combination? That’s how I felt when I tried Bacon Wrapped Beef Tenderloin With Creamy Mushroom Sauce for the first time. Three of my favourite things all combined in one absurdly delicious dish, what more could a girl ask for? (well, maybe a personal chef to cook this for me on a daily basis, but I’ll let that one slide for now). 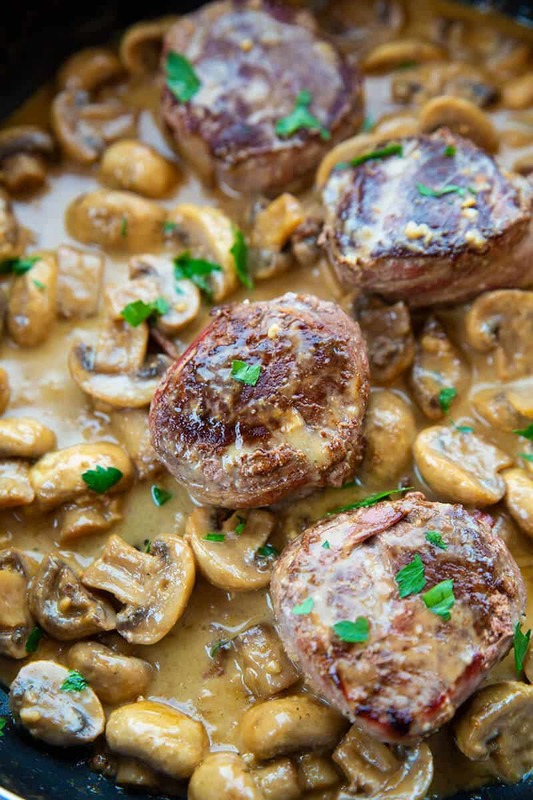 This Bacon Wrapped Beef Tenderloin is made even more decadent with a creamy mushroom sauce. They (I) say everything tastes better with bacon, and they’re right. This meat is a little on the expensive side, so I’ve put together this Bacon Wrapped Beef Tenderloin With Creamy Mushroom Sauce recipe to make sure nothing goes to waste and you get it right the first time around! That said, the best way to save on this is to buy the tenderloin whole and untrimmed and then trim it yourself at home. In a large skillet, heat the olive oil on medium-high then fry the beef tenderloins until they are browned on the outside. You want to quickly brown and sear them, around 2 minutes on each side, then, later on, you will continue to cook them. Once they are nicely seared and browned, remove them and place on a plate. Tent with tinfoil. Fry the mushrooms and onion in the pan in the butter until the onions are soft and the mushrooms have reduced in size and released most of their moisture. Add in the garlic and fry for 1-2 minutes until browned and fragrant. Reduce the sauce for another 5 minutes, then whisk together the cream and the cornstarch. Whisk rapidly into the mushroom sauce and let thicken. Return the beef tenderloins to the skillet and continue to cook in the cream sauce until they are heated through to the middle and are the doneness that you desire. Beef tenderloins are best when they are rare to medium-rare. Do I Have to Use a Mushroom Sauce? Not a mushroom fan? No problem! There SO many sauce variations to choose from when cooking your Bacon Wrapped Tenderloin. You could try a red wine sauce (yum! ), horseradish sauce, or a simple balsamic glaze – the options are limitless and it all depends on your own taste. What Does The Perfect Beef Tenderloin Look Like? Tenderloin is a meat that you really can’t get away with overcooking because it will simply become tough and dry. 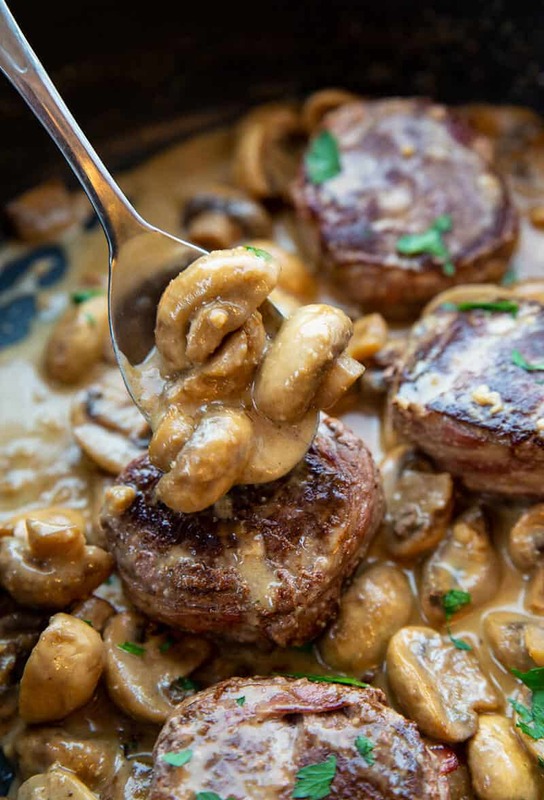 If you’re having guests then it’s likely that many of them will have a preference for overcooked meat, but this Bacon Wrapped Beef Tenderloin With Creamy Mushroom Sauce recipe doesn’t have to suffer because of this! Beef Tenderloin can be cooked medium rare which is usually a happy balance for all guests. The perfect Beef Tenderloin will be pink in the center with a nice browned flavour on the outside. It should be filled with natural juices and tender enough to cut with a fork (see what I mean about not overcooking?). If your Beef Tenderloin is cooked properly, it will be juicy and tender whether it’s served hot or cold. What Should I Serve with My Bacon Wrapped Beef Tenderloin? There are lots of side options for this dish but I like to serve mine with some simple mash and my favourite steamed vegetables! Some garlic mash can also be a nice addition. Alternatively, you could try some foil-wrapped baked potatoes filled with cheese, sour cream, and chives. For a lighter side option, a Caesar Salad is usually a safe bet! And don’t forget about dessert too! I hope you enjoy this awesome dish as much as I do! Slow Cooker Beef & Sweet Potato Stew: if you haven’t tried cooking up a stew with sweet potatoes yet, you need to try this! Simple and Delicious Crock Pot Beef Stew Recipe: nothing fancy here! Just a simple yet delicious crockpot recipe that’s easy to throw together when you’re in a fix. While you can definitely slice and wrap your own beef tenderloins with bacon, I use the pre-done medallions that you buy in the store. It’s SO much easier and time-saving! Happy cooking! 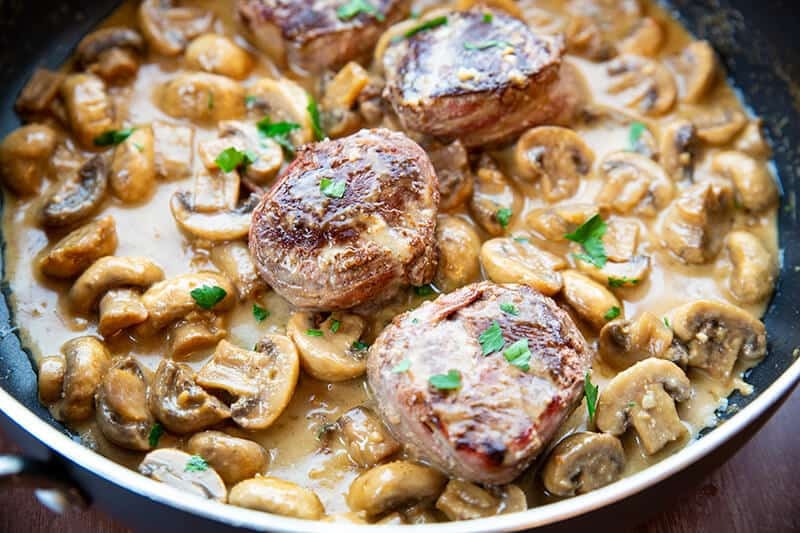 This Bacon Wrapped Beef Tenderloin With Creamy Mushroom Sauce is a mushroom lovers dream come true in an easy one skillet meal. In a large skillet, heat the olive oil on medium-high then fry the beef tenderloins until they are browned on the outside. You want to quickly brown and sear them, around 2 minutes on each side, then later on you will continue to cook them. Once they are nicely seared and browned, remove them and place on a plate. Tent with tinfoil. Fry the mushrooms and onion in the pan, in the butter until the onions are soft and the mushrooms have reduced in size and released most of their moisture. Add in the garlic and fry for 1-2 minutes until browned and fragrant.